A collaborative group of researchers from Oxford University’s Wellcome Trust Centre for Human Genetics (WTCHG) and genome analytics company Genomics plc announced the first sequencing and analysis of multiple human genomes using nanopore technology. This announcement marks a breakthrough in sequencing technology in opening up the potential of wide-scale, whole-genome sequencing in humans using nanopore approaches. Nanopore sequencing is relatively simple, but elegant, technology capable of reading long stretches of native (unamplified) DNA with very little processing involved. Essentially, a small pore roughly 1 nanometer in diameter (about 100,000 times smaller than the width of a human hair) is made either by a biological molecule, such as α-hemolysin, that traverses a membrane; or by “punching” a pore through a solid support using an ion beam. The system is then bathed in a conductive fluid, and a voltage potential is applied across the membrane pore complex. As each DNA strand or single nucleotide is electrophoretically driven through the pore, the current fluctuates and is picked up by a detector allowing the sequence or nucleotides to be read. This new announcement raises the possibility of a major change to both the economics and the science of DNA sequencing. 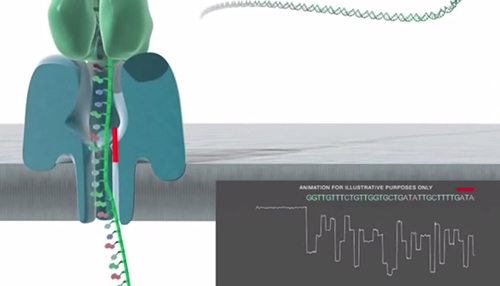 Researchers at the WTCHG and Genomics plc used the MinION sequencer developed by Oxford Nanopore Technologies. The portable MinION is a hand-held device about the size of a candy bar and is powered by a laptop computer to which it connects via a USB port. It is available for $1,000 plus the cost of consumables. While nanopore sequencing has been in use for a few years, previous applications were targeted to relatively small genomes or regions of DNA, such as the much smaller genomes of viruses and bacteria—making it a useful tool for frontline surveillance of emerging infectious diseases. However, recent improvements to the technology now make it possible for researchers to conduct large-scale studies such as sequencing complete human genomes by using multiple MinIONs.